What’s in a name? A lot if you believe our politicians. But if a place where you were born, suddenly decides to call itself by another name one day, it comes across as a weird surprise. It’s like a third person forcibly trying to dictate terms for a special, private bond that you share with a friend. Behaviour often described as “Chalti mein chadhna” in Bambaiya lingo. The invasion aside, I thought of visiting an old friend, whose deserted streets and blinking amber lights once lit up the dreams of my formative years. And to revisit Bombay within Mumbai, accompanying me was the Renault Captur Petrol. 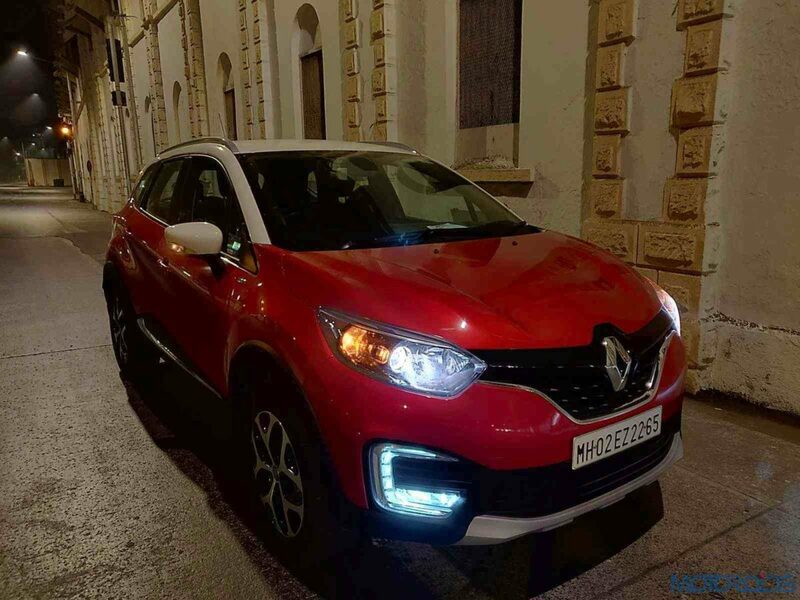 Follow this link for a Full Review Of The Renault Captur Diesel. Like any other city in India, driving around during day time in Bombay is a chore. Even for someone who loves cars. But once the sun goes down and the traffic parks itself, the true magic of this place is visible and felt in a profound manner. Renault sent us a car so fresh, even the plastic on its red and blue contrast stitched fabric seats was intact. A Good thing, because the fragrance of a factory fresh car helped while driving through sections where the city’s bloat gets offloaded into the sea. I started to trace the veins of my old friend, from north to south. 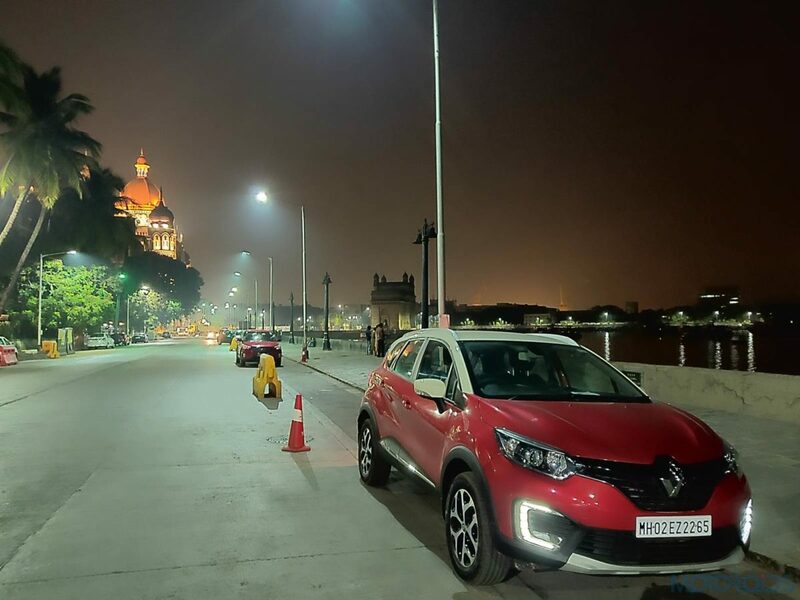 Getting out of the narrow lanes outside my house, the Captur Petrol’s steering felt heavy at first, but with time, I started to appreciate how it wasn’t lifeless. While piloting this Red and white thing, I also could notice how it dealt with the broken roads all over the city in a solid manner. And it had to do that almost all night, for our town planners thought that it’ll be a great idea if we work on a Metro system for the financial capital of this country, only once it’s down on its knees, almost begging for one. Post that, it was time to meet the city’s new poster boy and drive towards a gate built to commemorate the landing of British Royalty on their visit to India in 1911. The Bandra Worli Sea Link is a modern marvel which I witnessed being built at a pace slower than a snail, string after string. Driving the Captur on its well-paved roads, the Captur felt composed and very European. The petrol engine’s 106 Horses and 142 Nm felt adequate at part throttle, as I cruised and the motor ticked away in a refined manner. I tried to gain some speed and mashed the pedal to figure out that although low-end power delivery is good, building fast momentum takes time. Also, the engine develops some vocals in its higher rev range, which did call for a few dogs to chase a red car pointlessly. 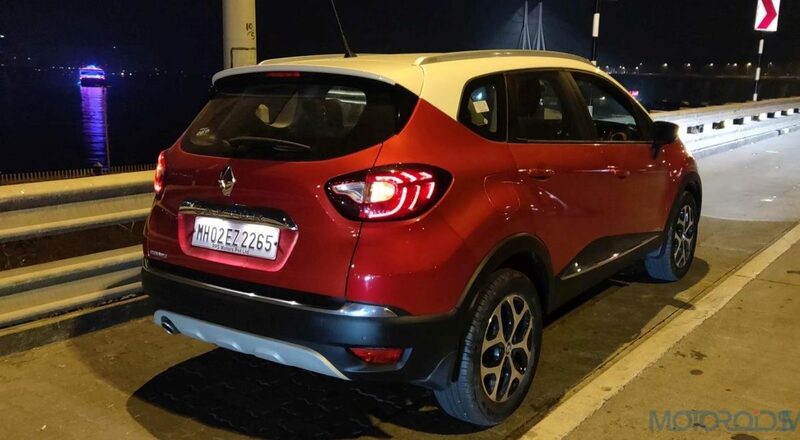 For within town use then, the Captur’s petrol motor scores well on driveability and it’s only on open roads that it comes across as a little lacking in thrust. After a few short throws on the 5-speed gearbox and some light work for the left foot, I parked again next to the Gateway Of India (Thankfully not renamed until now) and began to appreciate its storied existence, accompanied by an equally legendary Star Hotel right next. 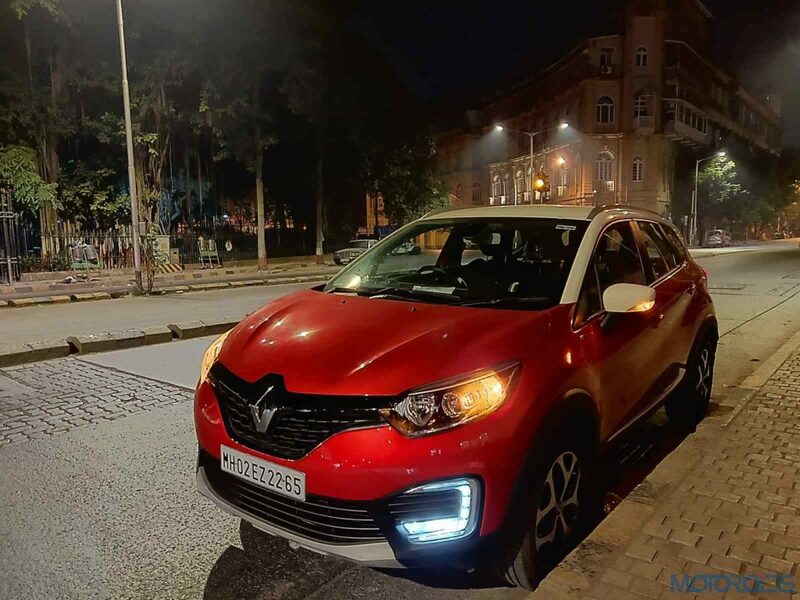 While sitting under one of the elegantly shaped street lights, I realised this Captur misses out on LED illumination which the Platine trim gets. But this one has uniquely shaped LED DRLs in its bumper alright. No wonder plus-sized businessmen returning home after shutting shop turned their heads inside their fat MPVs to give this thing a second look. 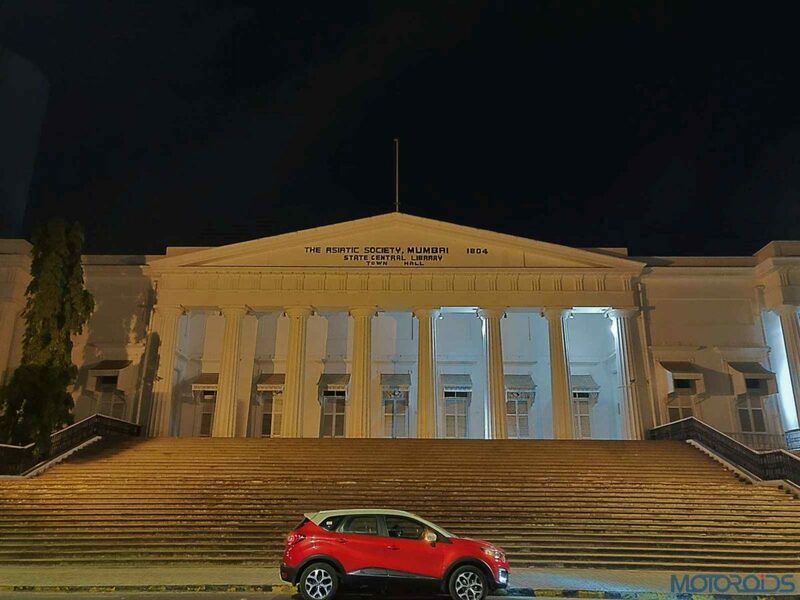 The last stop for the night before the Captur Petrol’s finely designed 17″ wheels rolled home was the State Central Library. If you’ve followed Bollywood, you’d recognise this place as the spot where many characters come out of a court hearing and either get shot or shoot someone. The grandeur of the structure and those iconic steps is still worth experiencing though. Driving back home on a deserted road, the Captur Petrol turned out to be a good looking, solid companion for the night. It even managed a 10.9 km/l number through the city’s streets. What about Bombay? The Captur’s decent sounding but now dated infotainment system tuned into a radio station which decided to play “Yeh Hai Bombay Meri Jaan”. Since the time Johnny Walker lip-synced to Mohammad Rafi’s voice, those lyrics still hold true for what this City is all about. A place so mad during the day, yet, tranquil and beautiful, when it’s half awake. It doesn’t sleep, remember? And no matter how many times its name gets changed, for some, there will always be some Bombay still left in Mumbai. Carplay? No. Android Auto? No.